NASA’s InSight spacecraft has undergone pre-launch testing at Lockheed Martin in Colorado. A seismometer instrument destined for Mars has leaks in its vacuum container. The problem could delay the scheduled 4 March launch of NASA’s InSight spacecraft, which is supposed to carry the seismometer to the red planet. InSight’s goal is to study marsquakes and deduce the planet’s interior structure — never before studied — by measuring the speed at which seismic waves travel through it. The Seismic Experiment for Interior Structure, built by the French space agency CNES, is the instrument InSight needs to accomplish that goal. Technicians have detected a small leak in the vacuum-sealed sphere that holds the instrument’s three seismometers, NASAWatch reported and NASA confirmed on 3 December. The leak must be fixed for the mission to accomplish its science goals. CNES engineers are working to repair it before shipping the instrument to the Vandenberg Air Force Base in California to be installed in the spacecraft and tested. The InSight mission is designed to study seismic activity on Mars. It remains unclear whether the problem is severe enough to bump InSight out of its scheduled launch window of 4–30 March. If it does not launch by 30 March, it could be delayed for many months until Earth and Mars are once again in a favourable geometry. “NASA and CNES managers are committed to launching in March and are currently assessing the launch window timeline,” the statement said. The US$425-million spacecraft is currently at Lockheed Martin Space Systems in Denver, Colorado, where it has undergone tests to simulate the space environment. It will be shipped to Vandenberg in the coming weeks, and the seismometer instrument is scheduled to be added to it in early January. 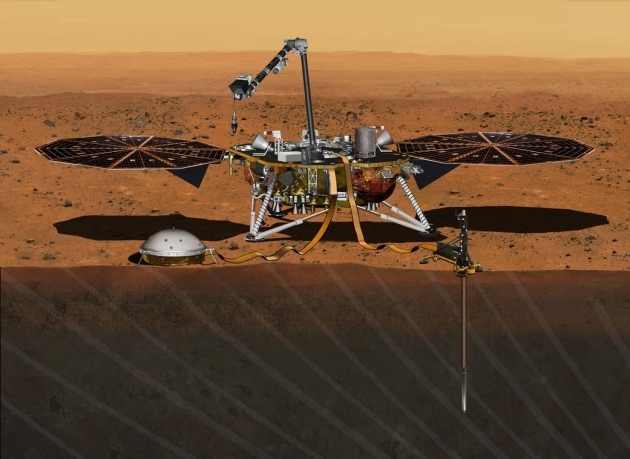 InSight — which stands for Interior Exploration using Seismic Investigations, Geodesy and Heat Transport — also carries a separate instrument to measure heat flow at the Martian surface. That instrument, built by the German space agency DLR, is already installed inside the spacecraft. If it launches in March, InSight is slated to land near the Martian equator on 28 September 2016 and work for two Earth years.